The 2015 Drum Corps International Tour officially kicked off on Wednesday, June 17, with six corps debuting their competitive productions at Lucas Oil Stadium in Indianapolis. Rainy weather made for a wet entrance into warm-ups, and the anticipated opening of the stadium roof was also called off. Regardless, inclement weather didn’t stop the intensity of the tour’s premiere performers, which included the Madison Scouts, Blue Stars, Carolina Crown, Cavaliers, Cadets and Bluecoats. On the score sheets the Allentown corps took first in overall General Effect and Percussion. Just over a point and a half behind, the Bluecoats took second with a score of 68.250. With its 2015 show, “Kinetic Noise,” the corps expresses noise and energy through sound according to drum major Willie Veenstra. Carolina Crown placed third (68.100) with its show “Inferno,” which illustrates themes from Dante’s literary classic of the same name. 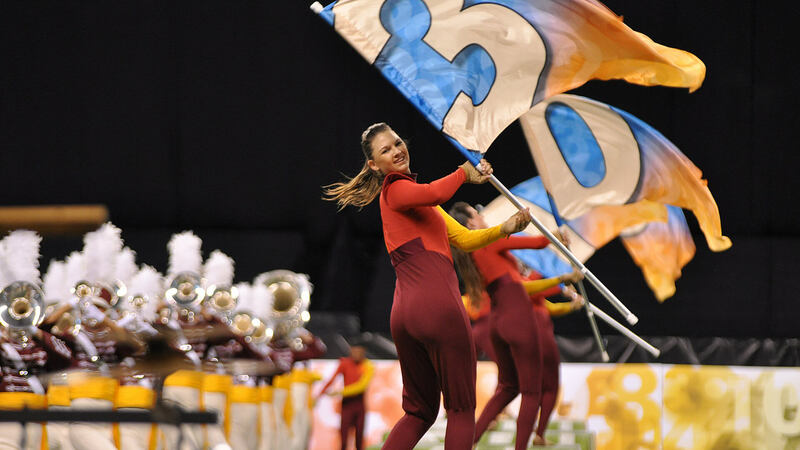 An opening flag routine by the color guard and daunting music quickly captivated the audience, earning the corps first place in the overall Visual and the Brass captions. The Madison Scouts, who started the evening with their show, “78th and Madison,” finished in fifth with a score of 61.500. The corps made an appearance earlier this week during a joint dress rehearsal with the Troopers on Monday night at Ben Davis High School in Indianapolis. The Blue Stars took sixth place, scoring 60.950. “Side Show,” which is set during the Great Depression, surprised audience members with illusions of eye-catching jugglers, sword-swallowers and clowns. With the 2015 DCI Tour officially underway, these six corps will hit the road heading to their next competitions. Just 51 days from now they'll end up back at Lucas Oil Stadium for the DCI World Championships.